This fine offering provides a comprehensive engineering analysis of the "disruptive discharge" resonance transformer. 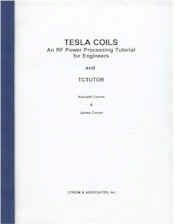 Included along with the book is IBM compatible "TCTUTOR � A Personal Computer Analysis of Spark Gap Tesla Coils." The book and accompanying software place particular emphasis upon examining the historically significant Colorado Springs oscillator constructed by Nikola Tesla in 1899. Included is an extensive RF power processing tutorial which is aimed at the Junior/Senior Physics or Electrical Engineering audience. While a firm understanding of Maxwell's Equations and some background in microwave engineering would be necessary to fully grasp these concepts, the authors do a fine job of translating the mathematical formulae and expressing them verbally in an easily comprehendible style. The software, written for the IBM family of personal computers, features routines for the examination of time domain, Fourier spectrum, and resonator performance. Unlike the analytical portion of this package, the program assumes only that the user is generally familiar with the basic construction of Tesla coils. It has been designed to be as easy to use as possible, and yet not be overly simplistic.